Herbst's rivals bit off more than they could chew at Alta Badia in the slalom. (CNN) -- Austria's Reinfried Herbst showed he is in fine form in the run up to the Olympics by claiming his second World Cup win of the season with victory in the slalom at Alta Badia on Monday. Herbst claimed a silver medal at the 2006 Turin Winter Olympics in his specialist discipline and will be hoping to go one better in Vancouver in February. He finished just 0.08 seconds ahead of Swiss Silvan Zurbriggen with fellow Austrian Manfred Pranger in third place, 0.17 seconds back over the two runs. Herbst trailed reigning world slalom champion Pranger after the first leg on the Gran Risa course, but his combined time of one minute 49.31 seconds saw him claim a superb victory. Zurbriggen had the fastest second leg time to move ahead of Pranger in a desperately close finish at the Italian ski resort. Herbst, who won the other slalom held this season in Levi, Finland last month, is leading that discipline with a maximum 200 points ahead of Zurbriggen on 102. "I am exceeding expectations," Herbst told gathered reporters. "I wanted to have a good start but I wasn't expecting this." Fellow Austrian Benjamin Raich maintained his lead in the overall standings despite going out on the second run. The Olympic slalom champion -- he relegated Herbst to second in 2006 -- was third after the first run. His closest rival, Carlo Janka of Switzerland, also went out on the second run and trails Raich by 12 points overall. Local hero Manfred Moelgg of Italy finished fourth and Michael Janyk of Canada claimed fifth. Janyk will be on home snow in British Columbia for the Olympics. The men's circuit now takes a short break over Christmas before returning for a downhill at Bormio on December 29. 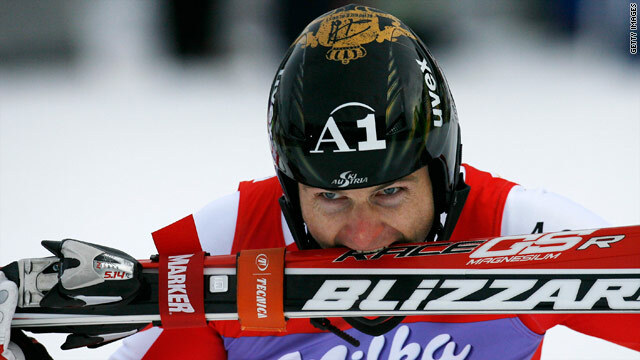 U.S. hopeful Bode Miller will hope to be fit for that test, having sat it out in Alta Badia with a sore ankle.